This is our basement studio. My husband creates stain-glass and I quilt. We have fun and feel lucky to share this space together. 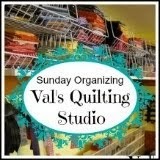 Since my sewing room is my living room - I have to keep organized. Would some day love a dedicated studio/sewing room. WOW! you have an awesome space. I grew up in Ohio with a basement and my mom sewed there. In Texas we have no basements and I sure do miss them. Lucky you, love your space! I hope you find something that works for you. I love organizing and moving things around in my craft room. My sister-in-law came to play today, and we had so much fun in there together. Val, that us a great space! I am sure you will have some great ideas. Keep us posted. I am a little OCD when it comes to organization. I love to organize my fabric as much as I do sewing. Now off to check some of your tips. I am sure I will learn something new. Thanks for the links. This is a dream of a studio! Thanks for the tips! I could just plop down on that chair with the buffalo blanket with a cuppa and chat away with you. Ohhh, I look forward to seeing what you come up with. You have a nice space for stitching. Do you ever finish organizing? I'm beginning to think not.